The three pictures you see below were all painted by Iowa native son Marvin Cone. All come up for auction next week. All are interesting – all the more in juxtaposition. 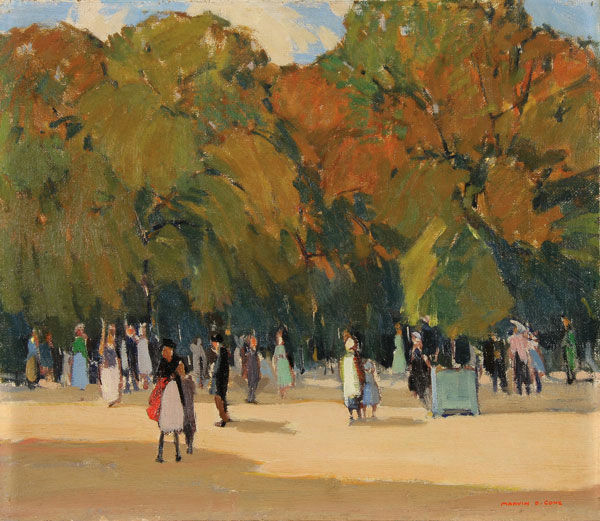 The first, just below, is titled “Sunlight and Shadows – Luxembourg Gardens Paris 1929”. Though it is expected to draw the least interest and least dinero I quite like it for a number of reasons. First, it is indeed pleasant to look at. Though not exactly exuberant, it conveys a fine sense of the joy concomitant with a stroll through a park in the height of fall foliage. And I know that park. It’s not far from the Louvre and my first perambulations therein followed shortly after an eye-opening Art History 101 and during a revelatory term abroad. I fell under the spell of the ‘City of Light’ the moment I stepped off the train. And further to that point – the painting, having been executed in 1929, came well after the height of impressionism and a decade after the creation of cubism by Picasso and Braque probably just blocks away. I relate in a proud and positive way to the combination of naiveté and insouciance indigenous to this great state. The painting below – “White Barn No.1” clearly, if blandly, has turned away from what some (still!) would call European avant-gardism. Stated more positively, it is a visual metaphor for the hard working, simple and straight-forward valued folks of our nation’s heartland. “Farm Silhouette” at bottom is expected to make the highest bid of the three lots – $125,000 to $175,000 – and for me also has the most complex emotional tone. On one hand it evinces a crepuscular nostalgia for rural America. Cone painted “Farm Silhouette” in 1948 – long after the sunset of Regionalism, after the horrors of WWII, after the incredible industrialization ofAmerica, and after he and his better known brethren (Grant Wood, Thomas Hart Benton, and John Steuart Curry) were compared with the social realists of 1930s Russia. As an artist, on that bluff, he must have felt from afar the wash of the abstract expressionist zeitgeist. Clearly the painting is in very good condition with original frame and stretcher. Black light inspection showed no in-painting or restoration. Paper trail (aka provenance) seamless all the way back to the artist. This entry was posted on November 11, 2011 at 10:04 pm and is filed under Art. You can follow any responses to this entry through the RSS 2.0 feed. You can leave a response, or trackback from your own site.